Rodama: a blog of 18th century & Revolutionary French trivia: The Church of St Geneviève .... or not? Among the riches of the Carnavalet is easy to wander past this painting by Pierre-Antoine Demachy, but do a double-take. 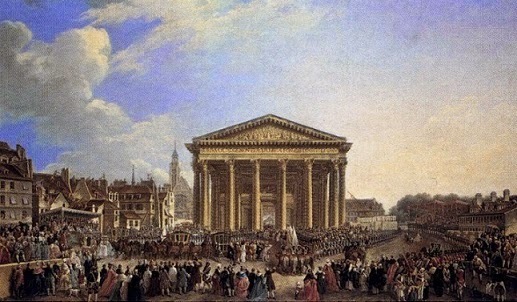 This is clearly the Panthéon (in its previous incarnation as the Church of St.Geneviève), but where is the dome? The answer, of course, is that the picture depicts the ceremony, held on 6th September 1764, in which Louis XV laid the first stone - the church had yet to be built! 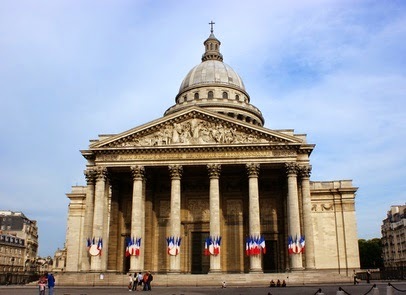 The facade in the picture was just an enormous and splendid canvas, designed specially for the occasion by the church's architect Soufflot, who also painted the floor plan of the church on the square and the road leading to it. It was Demachy himself (who had designed theatre sets for the Collège Louis-le-grand and for the Opéra) who painted the architectural features and Callet the sculpted ornaments. It was presumably on the strength of this work, that in 1764 Demachy was given the grand office of "peintre d'Architecture des décors de théâtre aux Menus Plaisirs du Roi ". No wonder he depicted the occasion so lovingly! The painting is worth noticing too for the details of the ceremony: the stage for the dignitaries, the royal carriage, the piece of stone ready to be laid. The Carnavalet really don't want you to cut and paste their images, so I won't, but you can explore the picture in close-up on their website.